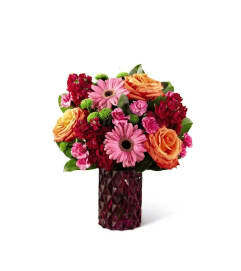 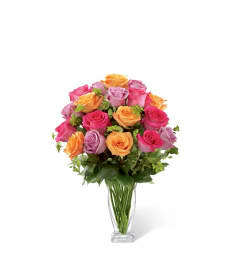 The FTD® Loving Thoughts® Bouquet is a beautiful display of graceful pink blooms set to convey your every emotion. 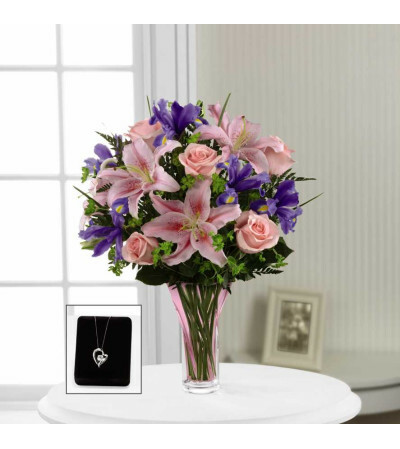 Pink roses and Oriental lilies are accented with the cool blue shade of iris and an assortment of lush greens to create a fantastic flower arrangement. Presented in a designer pale pink glass vase and accompanied by a stunning sterling silver heart-shaped pendant with a genuine white topaz accent, this mixed flower bouquet showers your special recipient with sweet elegance to express your love on Mother's Day, celebrate a birthday or convey your heartfelt thanks and gratitude.